What does a Therapy Horse do? The horses of Midnight Farm's therapeutic riding program are amazing and we couldn't do our jobs without them! The roles our horses play in our program are many and varied and can be challenging for a horse's naturally cautious nature. Horses are often ridden up to 8 times a week with riders of all ages and abilities. They must be calm, quiet, and patient in any number of situations that would make other horses nervous. Riders often carry unusual objects over, around and/or through obstacles which are often decorated for games and activities. Riders may not be as balanced or coordinated as riders horses may be used to; the horse must be willing and able to discern what a rider is trying to ask of them. Therapeutic Riding horses are constantly surrounded by people. They often have 3 volunteers and an instructor working with them in addition to the rider. They must be able to integrate all of the input from everyone around them and still remain quiet and responsive to the riders. In return for their kindness and patience, they get the love and devotion of everyone they meet! The trade-off seems to work well for them. Interested in Donating a horse? Our horses are carefully selected for the specific needs of our riders and the types of services we are offering. We have considered their health and soundness, gaits and manner of going, attitude, temperament, ground manners,previous training, use and finally, adaptability. Once the preliminary selection or acquisition of a horse is made, the trial period begins. Working with the horse during this period allows time to determine whether he will fit into our program. The following horses have been accepted into our program and are undergoing continuous specialized training for our needs. Color Me Vanzi, aka "Vanzi"
Vanzi is a 1998 American Quarter Horse gelding. Before coming to Midnight Farm, Vanzi enjoyed a successful show career with AQHA in Hunter Under Saddle, Western Pleasure, Horsemanship and showmanship. Vanzi has a narrow build and is an excellent choice for riders who have difficulty sitting a horse with a wider build. 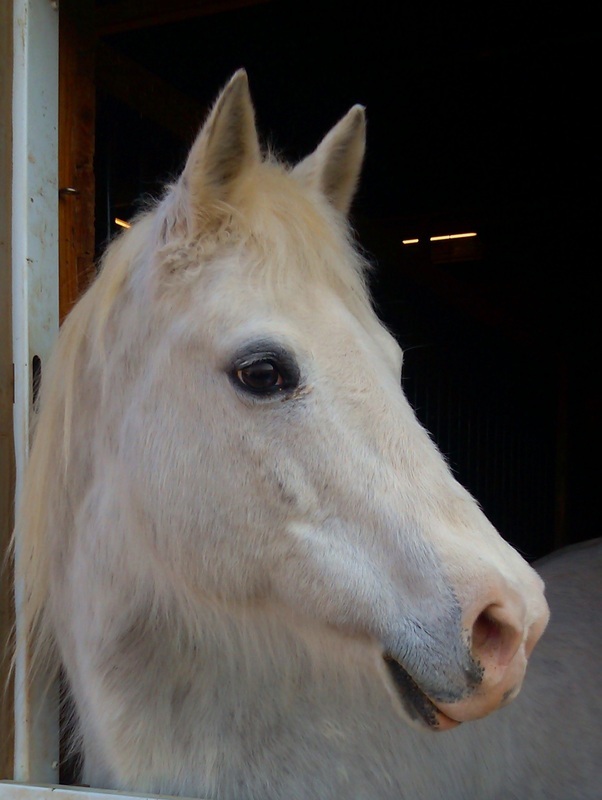 He is very friendly and energetic and loves to interact with his riders and farm visitors. Awesome Golden Glo aka "Aussie"
Aussie is a 2001 American Quarter Horse gelding. He is the 2008 and 2009 Youth 13 and Under All-Around Champion in the PHBA. Well-trained, calm and patient, Aussie is a trusty mount for our smaller riders who are full of energy. He is also short and stout, so he is a great option for our adult riders who need a lot of physical support, and his extensive show experience makes him a skilled teacher for our independent riders. Aussie is a horse of many talents who is full of 'personality' and is a favorite of riders and volunteers alike. Maggie is a 2006 America Quarter Horse mare. She is small but mighty! Maggie is a great size for our smallest riders, but can still carry adults easily. She is very friendly and interested in all that happens in the barn. Maggie is one of our youngest horses but has proven to be a great horse for us. Her inquisitive nature and beautiful coloring make her a favorite! Flash is a 1999 Pinto mare. She is another short but strong horse who works well with riders of most sizes. Flash is sweet and sensitive and extremely social. She keeps track of all of the other horses in the barn as well as all of the people coming and going. Buster is a 2004 pony gelding. He is very friendly and curious and loves people. Buster is always interested in whatever is going on at the farm, and always willing to visit with our guests to make friends. Though not used in our riding classes, Buster does give pony rides at special events here at the farm and also works in our day camps. Buster is great for ground work in these camps, as his smaller size can be less intimidating than the larger horses. Lulu is a 2003 pony mare. She is smaller than Buster and is a little more shy and reserved than he is, though you will often hear her neighing at you when you come in the barn. When working, Lulu is quiet, kind and loves to be brushed. She and Buster are good friends and can often be found out in the pasture with Rick. In this group, Lulu is the smallest but is also the boss, proving that it's all about attitude! Lulu works with Buster in the day camps and giving pony rides to the smallest riders at our special events.